$299 TV install over fireplace w tilt wall bracket, 1power outlet, 1 hdmi cable and all wire concealment!!! What is included in a professional installation? Site Survey to explain the installation to the client. Connect television to your Directv,Amazon Fire , Apple TV . 1 year warranty on all work done! This includes: TV on the wall installation and no wire concealment. $ 149 Standard TV Install with concealed wires in wall. This is the most popular ! It includes TV installation with "concealed wires" in wall! $25 Add high speed Hdmi cable-15 ft. ASK FOR OUR GROUP RATE ON MORE THAN 2 TV INSTALLATION! Ask about my discounts for military, seniors, teachers, daycare providers, Costco Sams club members, my bartenders, RN's, LVN's, well just ask! Installation rates are subject to change based on inspection. I bought my tv at Costco,and I had John install it because he installed a tv in my living room and he gave me the best price to install my second tv in my bedroom! Joe from Irvine. Cost for tv install on fireplace? 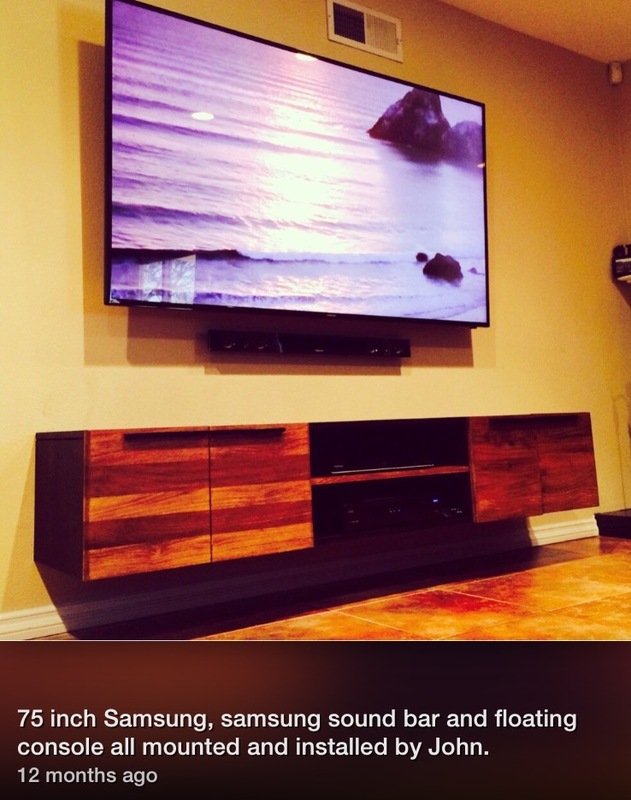 HOW MANY TV INSTALLS HAVE YOU DONE? Of course ! I'm the dude! find me on the yelp app! Dana, is happy to show off her new tv installed over her fireplace, all wire concealed in the wall. Tv installation in orange county cities- Plasma tv and lcd tv installation in-Aliso Viejo - Garden Grove - Santa Ana - Westminster - Huntington Beach - Fountain Valley -Fullerton- Newport Beach - Irvine - Costa Mesa - Tustin - Buena Park - Long Beach - Anaheim Hills -La Palma-Diamond Bar- Brea -Placentia- Yorba Linda -Sunset Beach-Seal Beach-Dana Point-Laguna Niguel-Corona Del Mar-San Juan Capistrano-Mission Viejo-Rancho Santa Margarita-San Clemente. WE NOW INSTALL TVS IN THE INLAND EMPIRE!